Ahuachapan is a city located in the department of Ahuachapán, in the western region of El Salvador, at 100 km from the capital city of San Salvador. The city is located at 780 m over sea level in a valley north to the Apaneca-Ilamatepec mountain range. 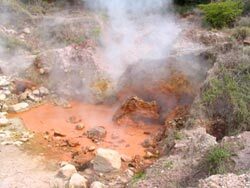 El Salvador is a pioneer in geothermal energy production. In the department of Ahuachapan (as well as in the city of Berlin, in the eastern department of Usulutan) geothermal power plants have been installed. Geothermal plants produce energy from the steam coming from the earth, this due to the numerous hot steam fumes (geysers) in the area. These power plants provide for 23% of the energy consumed in El Salvador. Ahuachapan is famous for its hot steam fumes, which can reach up to 960o C. and while there you can visit the geothermal plant LaGeo. The name Ahuachapán in Nahuatl means "place of house of oak or encino". The town was founded by tribes Pok`omames around the V or VI century. In the XV century, Ahuachapan was conquered by rebellious Nahuas tribes. On September 15th 1821 Ahuachapan became annexed to the former state of Guatemala, and later in February 1824 became part of El Salvador again. In march 1822 after the battle of ''Llano de El Espino'' between Salvadorian and Guatemalan republicans, commanded by the brigadier and self-proclaimed emperor Agustín de Iturbide; Salvadorians won the battle but a few months later were defeated by Vincenzo Filisola, which then led him to take over the city of San Salvador until 1823. 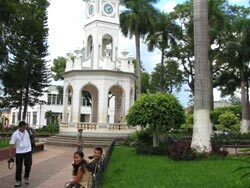 Ahuachapan was proclaimed a city on February 11 1862 and later on February 9th 1869 it was declared capital city of the department under its same name. The city has been hometown to many salvadorean personalities: Its beautiful colonial church guards the remains of one of Central America's most recognizable lawyers Dr. Isidro Menéndez (1795 - 1858). He was born in a house south to the main park of the city. The Park "Menendez" honors former president General Francisco Menéndez (1830 - 1890); a bronze plate shows where one of the regions greatest poets was born: Dr. Alfredo Espino (1900 - 1928) author of the poem "Jícaras Tristes". Discover the wonders of a unique country with us.